Romanenko, Aelita Romanovna, Elem Klimov and Larisa Shepitko, translated by Natalia Shevyrina, Moscow, 1990. Interview with Elem Klimov, in Filmfaust (Frankfurt), June-September 1983. Variety (New York), 3 August 1983. Martin, Marcel, and C. Zander, ''Cinéastes soviétiques à la recherche de leurs racines: Entretien avec Elem Klimov,'' in Jeune Cinéma (Paris), December 1983-January 1984. Revue du Cinéma (Paris), January 1987. Films and Filming (London), April 1987. Listener (London), 30 April 1987, and 12 May 1988. Petit, Chris, in Monthly Film Bulletin (London), May 1987. Makkonen, V., ''Elem Klimov elokuviensa takana,'' in Filmihullu (Helsinki), no. 6, 1988. Hollywood Reporter, 23 February 1988. Lafontaine, Y., ''Les adieux a matiora,'' in 24Images (Montreal), no. As the white-raincoated officials from the mainland emerge from the mist we get the feeling of the doom that is to overtake the little island of Matyora and its people. It is to be flooded to become part of a vast Siberian hydro-electric project. We switch immediately to the people of the island and their way of life, which is depicted with great understanding of their essentially happy existence rooted in a love of nature and of traditions which go back to pagan origins. In a film with such tragic implications there is, however, much gaiety which makes more poignant the inevitable ending. The island is sacrificed to progress. Engineers come and go. Arrangements are made for the evacuation which must take place. There are those, however, who prefer to remain in their homes and face death in the shadow of their ancestors. Klimov made the film in 1981, having taken it over from his wife Larissa Shepitko who was killed in a car accident. She had also written the script in collaboration with Klimov's brother Herman. It was based on a novel by the Siberian writer Valentin Rasputin. As with so many of Klimov's films it did not meet with official approval and was shelved for many years until his spectacular assignment to the powerful position of head of Soviet cinema under the glasnost policies of Gorbachov. Klimov, hitherto noted for his satirical and critical qualities, proves himself very sympathetic and understanding to the village life he depicts in this film. It is visually rich in its gallery of peasant faces, and the village life is portrayed with warmth and liveliness. Music plays a part in the lives of the people and there is a joyous village festival in which outside influences impinge on the supposedly isolated ambience of the peasants. Television is not unknown, of course, and the exploration of other planets, as well as boogie-woogie, are part of their knowledge. But to them the mainland across the vast expanse of water is hostile to their community life together. The brutal demands of progress will not respect their feelings. The destruction of their graveyard arouses them to action. Soon the first departures take place. Little details build up. The old lady searches frantically for her cat. Another, after locking up her house, looks back anxiously as a pile of logs collapses. The houses are closed up, and small domestic objects are rescued. Some of the houses are burnt. One house is washed and cleaned as if it was going to last for ever. All these things take us into the mind of the tragedy. The invocation of the spirit of the earth by old Darya is central to the film, and emphasises the pantheistic beliefs of the people. It may not be a paradise they are leaving but the anguish of the heart is just as great. Following hard upon Darya's wanderings through the wood, three men appear on their way to fell an ancient tree. The peasants are ordered to burn their houses before leaving. They depart in groups but Darya and some others prefer to remain and perish in the flood waters. 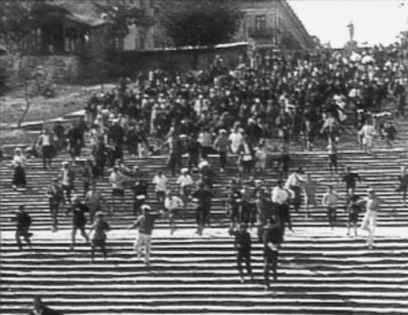 Watching the film one recalls the great traditions of the earlier Russian film-makers like Eisenstein and Dovzhenko whose spirit informs the film at so many points (the rough peasant faces and the toilworn hands who draw their strength from the land). The beauty of nature and its seasons, the poetry of rain and shine are photographed with loving care and given extra meaning to the sadness of the film. Matyora, deserted, faces the vast expanse of water which will in due course engulf it and something of value on this earth will disappear.